Yesterday, a generous friend gave me an enormous book: a big fat history of photography. I had not anticipated that this already splendid book full of beautiful old photos, would also tell me a lot about that other interest I have: space. One aspect of space that fascinates me, is the distinction between outside and inside spaces. Where exactly do we cross the threshold between being indoors and being out-of-doors? And where do we prefer to be? 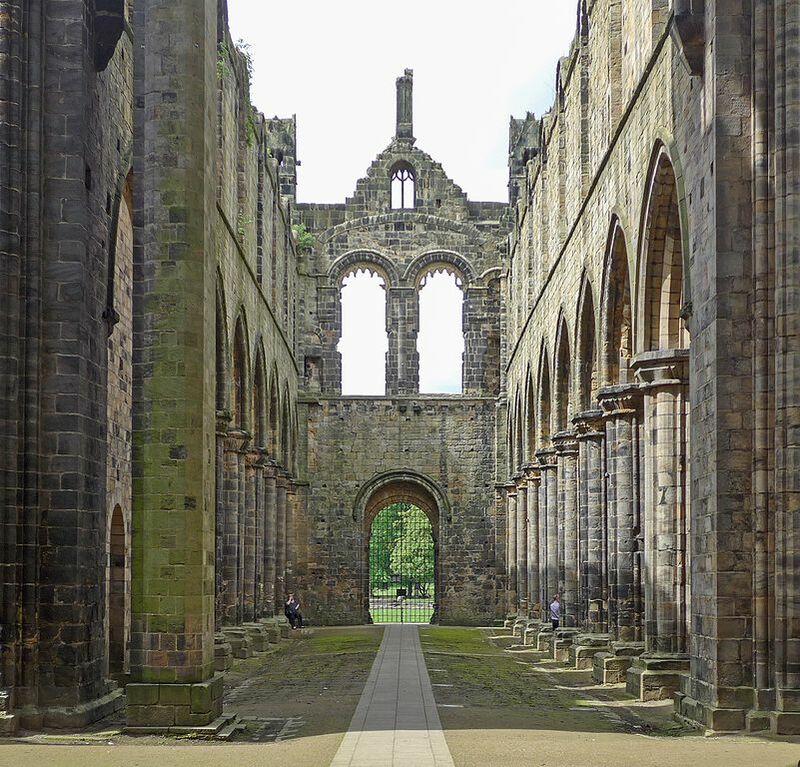 Tim Green, Kirkstall Abbey near Leeds (2016), CC-BY-2.0, on Wikimedia Commons. 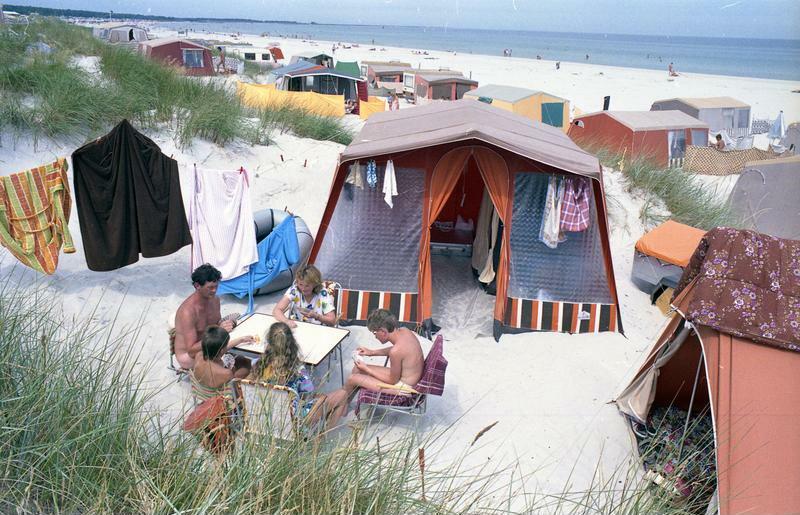 Jürgen Sindermann, camp site Prerow on the Baltic Coast (1990), Deutsches Bundesarchiv, Allgemeiner Deutscher Nachrichtendienst, Zentralbild, Bild 183, via Wikimedia Commons. Back to the history of photography. 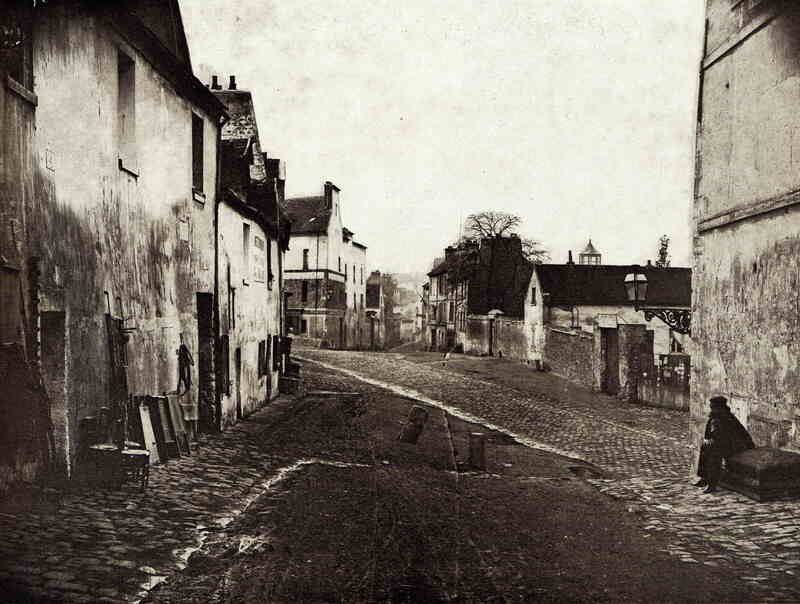 Very early photos, taken in the middle decades of the nineteenth century, seem to me to have frequently blurred the boundaries between inside and outside. This is visible in two types of photos discussed in the first chapter of my book. 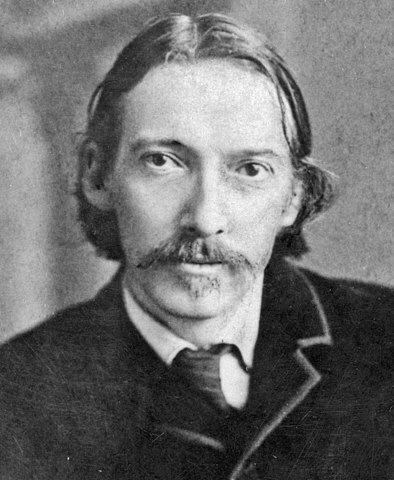 1) Most early photographic portraits follow the same pattern: the subject is seated or standing next to a table or column or such, against a simple architectural backdrop or curtain. All of this is placed – and this is key – on a nice, patterned carpet. In short, everything is done to suggest that the photo was taken in a comfortable drawing-room, or in someone’s study. 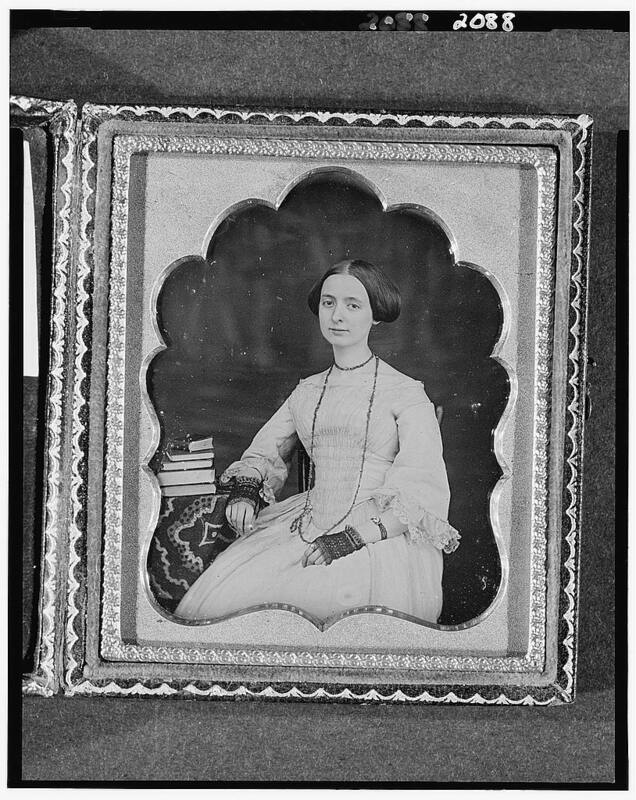 Portrait of Mary Ann Bartlett (1850 à 1860), Library of Congress Prints and Photographs Division, DAG no. 1218. 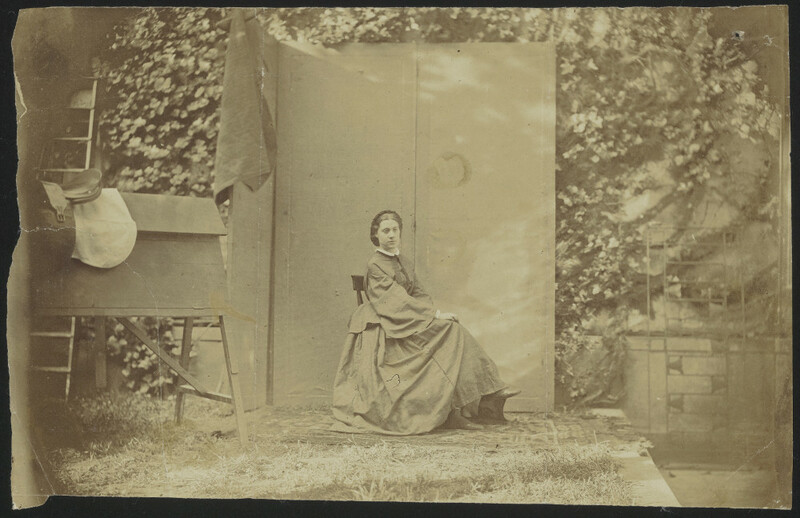 (Self-)portrait of Alexandrine Tinne in her own garden in The Hague (1860), Nationaal Archief of the Netherlands, Collectie 066 De Constant Rebecque, inventory no. 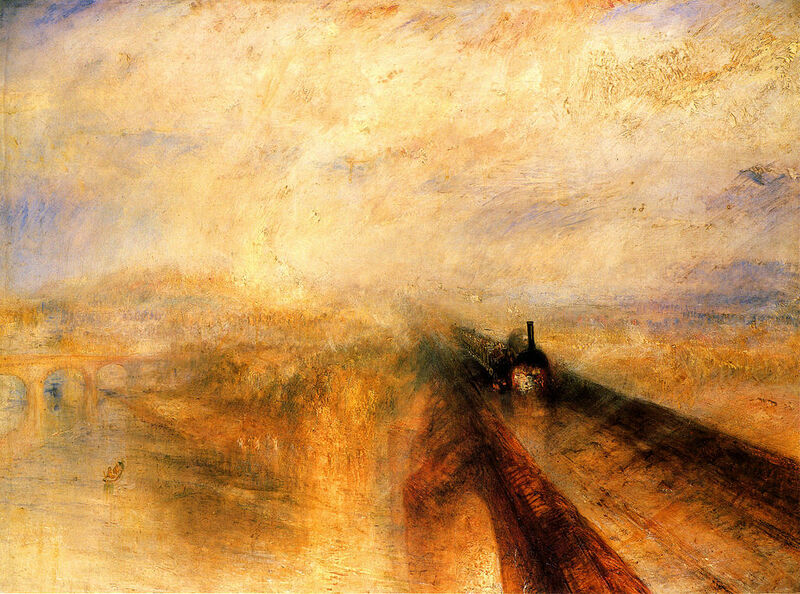 249 (public domain). Note the carpet. 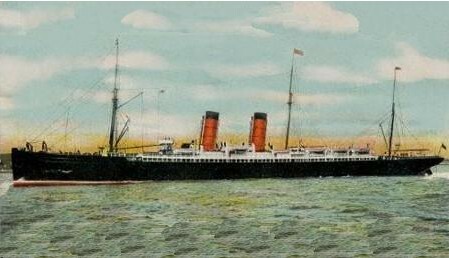 But also the saddle: Tinne was a famous explorer. 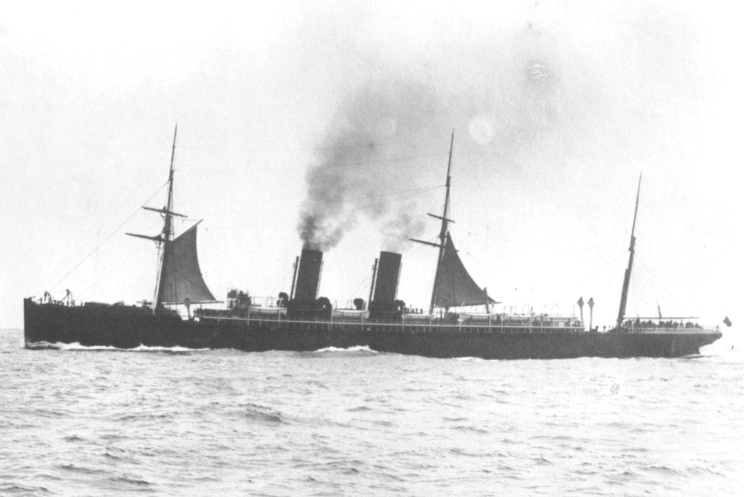 Photos such as these would later be cropped. Usually. 2) A completely different genre was formed by cityscapes, an outdoor genre. 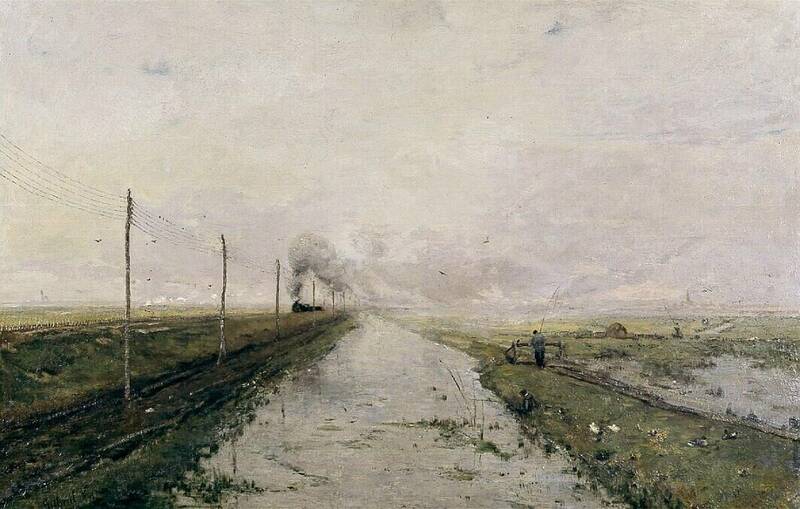 Yet again, in early examples of this genre the boundaries between inside and outside were blurred. Out-of-door pictures were often taken while the photographer was standing indoors, working their camera through an opened window; or they were taken from the rooftop of the photographer’s house; or else, if the photographer did leave their front door, quite close to home. They have that sense about them of a casual look out of the window, or of nipping out for a breath of fresh air on the doorstep. 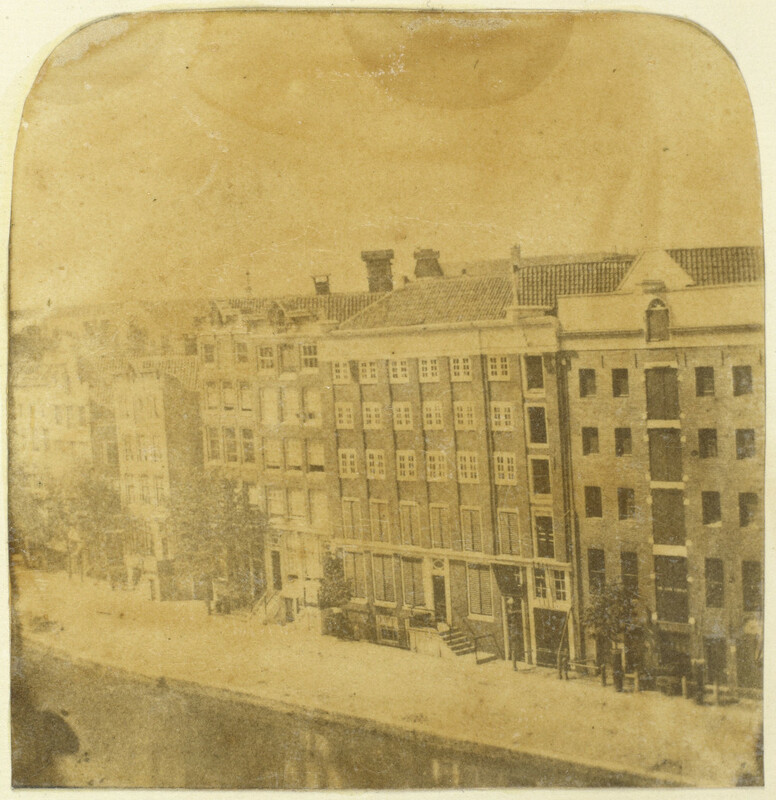 Eduard Isaac Asser, view from his rooftop, Singel, Amsterdam (c. 1852), Rijksmuseum Amsterdam, RP-F-AB12278-A (public domain). of course, in order to take a photo you also need light. And in the early years of photography, with less sensitive materials than now, you simply needed more of this, so the best place to go for all kinds of photos was outside. It was therefore in the nature of early photography to merge working outdoors and indoors. The very technology itself, which demanded both intricate equipment and a lot of light, turned these artists into amphibious creatures, who brought the parlour into the garden and the city into the home. The first chapter of the book: Saskia Asser, Mattie Boom, Hans Rooseboom, ‘Photography in the Netherlands in the Nineteenth Century: A New Art, A New Profession’, in Dutch Eyes: A Critical History of Photography in the Netherlands (Amsterdam: Waanders, 2007), 57-102. It’s a chilly January day in the city. I’m walking near the high street. From a distance, I see a homeless person lying on the pavement, huddled away in their sleeping-bag. As I get closer, I flinch. It’s not a person at all. It is three grey bin bags, waiting to be collected. This is what five years of living in a northern English city does to you. Your expectations make a U-turn for the worse, especially on days like this. But at the end of the day, that’s just public relations. Essential to our lives, to our living together, but not always true to our feelings. And not – dare I say it – not always the best course of action. Once in a while, might I be permitted to accept the gloom? For if everything is shiny and hopeful, I may lose my powers of judgement. I see this city today, and am reminded that it needs changing. P.S. Will the reader forgive me for not including an attractive picture in this post? This was written in January. That month, however, seemed to need something written in a different tone. Why is a Delft vase like a zipper bag? 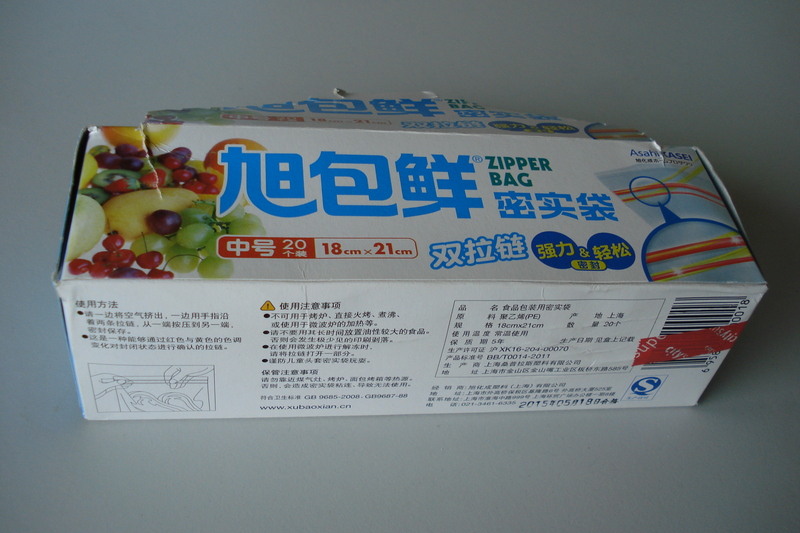 Food bag, acquired in eastern China, taken home to western Europe, photographed by author. Not only had I transported words such as ‘sweet’ and ‘breakfast’ back from China to Europe – this was weird enough, because these words mean completely different things in China where the bag was sold (in as far as English words in Latin script make any sense at all), than in Europe, the place where the words had come from and which I had now brought them back to. But the bag also pictured a series of household items which, in this style and combination, seem designed to evoke a snug English cottage, or perhaps a Polish farmstead kitchen, a nice old-fashioned home in the Romanian country-side, or any other place sitting firmly on the European continent. The coffee-pots, the loaf of bread, the stew pot, the single-leafed apple: they are European images, or else images associated with European settler cultures – please correct me if I’m wrong. And these images have become part of a European nostalgia, a nostalgia for the perfect home, imagined perhaps to have existed in the late nineteenth or the early twentieth century, a home, one might daydream, where there would always be a mother, a grandmother, a sister at home to tend the flowers in the garden and put them in the old coffee-pot. Yet as if such nostalgia isn’t unsettling (and delicious) enough, the European viewer is here also confronted with an outsider’s perspective on his or her private nostalgia. To the Asian producer of this bag, the existing, European nostalgia apparently made enough sense to use it for marketing purposes. Although the objects on the bag and the nostalgia attached to them probably have a different meaning to its Chinese users than to most Europeans (for one thing, bread in China tastes completely different from bread in Europe) – something must ‘click‘ for them. And although a rooted European will never be able to gauge exactly what these images mean to someone raised within Chinese culture, the European user nevertheless senses that the images have changed in the process of cultural transfer: not just because they are now surrounded by Chinese characters, but because they have been reimagined by someone with a different cultural baggage. The coffee-pot, the loaf of bread, all so familiar to me, have undergone a process of estrangement, of alienation. They have left my kitchen, circled the globe, and come back to me with a twist – a twist that might feel uncanny, because I do not know what has happened to them. However, if I were to go and live in China, the uncanny feeling would no doubt weaken: my alienation is only a lack of cultural knowledge. And the feeling also becomes less strong if I take a look at our shared history. For many Europeans, China has the name of being a culture of imitation: Chinese factories, Chinese pop singers, Chinese fashion designers, they say, take ‘western’ ideas and reproduce them more cheaply. Of course this stereotype ignores a vast range of ideas, fashions, technologies and tastes that originate in China itself. But what’s more, it ignores Europe’s own history of imitation. 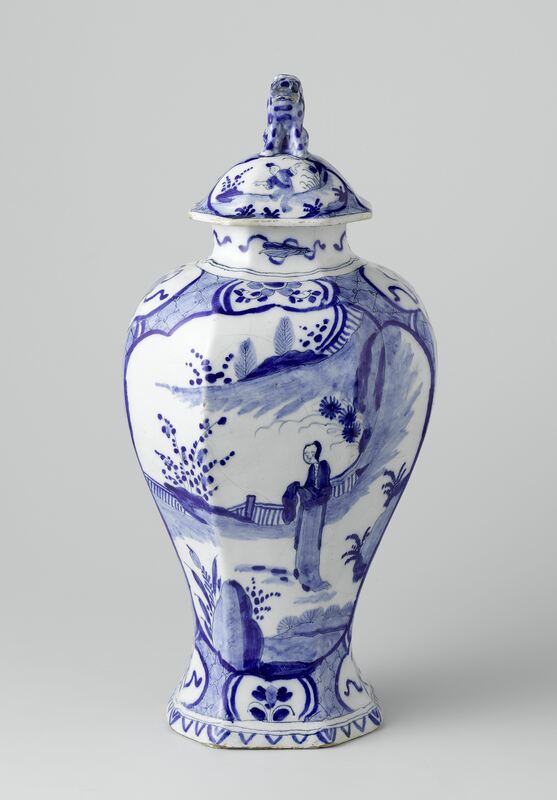 Painted pot and lid with Chinese figure in landscape, made in Delft (Holland) around 1750. Public domain; made availably by Rijksmuseum Amsterdam, object BK-NM-12400-114. How will Chinese traders have felt when they first saw Delftware, which imitated Chinese porcelain including even representations of Chinese landscapes and Chinese people? And what did the image on this vase mean to its first buyers – probably Dutch – in the mid-eighteenth century? It seems plausible that part of their satisfaction was the same as the Chinese owners of Chinese ceramics will have felt – admiration of the crafted pot, the painted surface, the landscape with the dotted bushes and the fashionable flaneur. The Delft buyers, however, will have experienced something extra: as a bonus, they were in touch with an exotic culture, one that was all the rage across the globe. 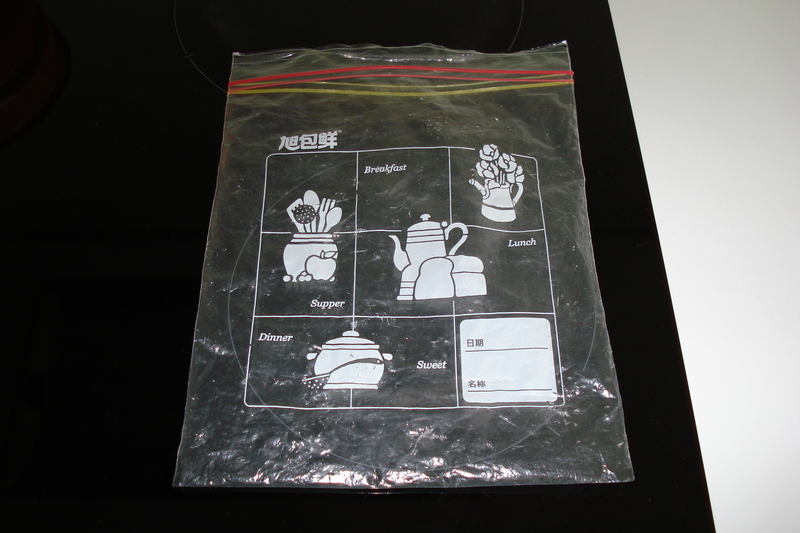 Although a plastic food bag is no dainty vase, I can imagine that the coffee-pot and the white loaf, too, bring a tiny element – not too much, because European-American images are more accessible to today’s Chinese than Chinese art was to early modern Europeans – a tiny element of the exotic into the Chinese kitchen. And back into mine. Box the bag came in, photographed by author. The Joy of Chinese Painting? How do you appreciate the two? On me, in any case, Fan’s painting made a much bigger impression. 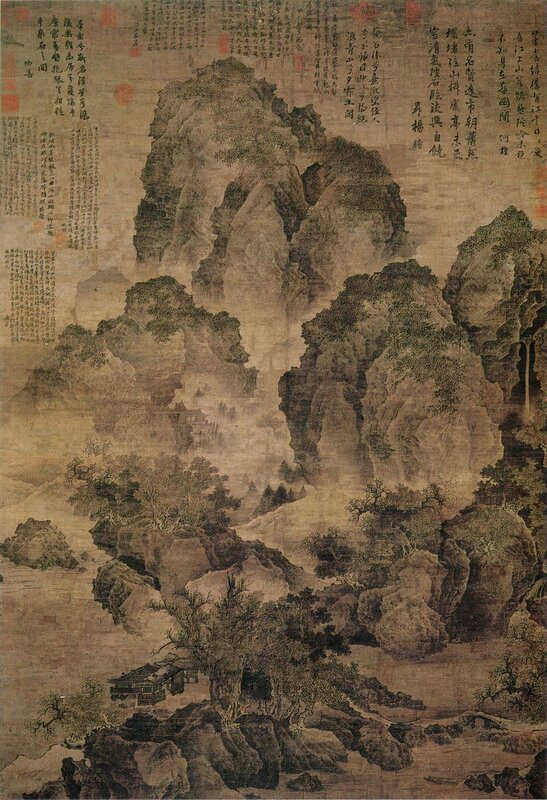 Now, I know very little about Chinese painting, but I think that I can safely say that both Bob Ross and Classic Chinese landscape painters worked in a circumscribed tradition, within genre rules that made each work clearly recognisable as a particular kind of landscape. I may offend people were I to call their works cliches, but both painters, I think, wielded stock elements, both specialised in particular painting techniques and both were masters in what they were doing. Then why do I admire Chinese landscape paintings such as Fan’s so much more than Ross’s? Is it simply the aura of exoticism that for me, as a European spectator, surrounds Chinese art? Or the aura of a venerable age (Fan’s painting is a thousand years older than Ross’s)? Or is perhaps something even more unfair going on? Pierre Bourdieu, the French sociologist, wrote how people derive status from showing off their cultural knowledge – or, to be more precise, from internalising high-status aesthetic taste. In other words, in order to ‘make it’ you have to find beautiful what others who have already made it also find beautiful. If this analysis is true for my feelings about the two paintings above, that means that in the end, I judge Fan’s work to be ‘art’ and Ross’s work to be ‘kitsch’ just because this is the taste expected from me. Or is it really something inside the picture that distinguishes Fan from Ross? Is his painting more skilled, more profound, more original? Who can help me?